European Space Agency astronaut Samantha Cristoforetti took this photo from the International Space Station to pay tribute to "Star Trek" actor Leonard Nimoy, who died Feb. 27, 2015. Two astronauts in space said goodbye to a science fiction legend on Earth by beaming back striking photos from the International Space Station. 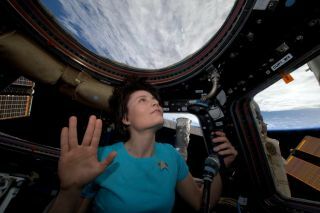 European Space Agency (ESA) astronaut Samantha Cristoforetti honored "Star Trek" actor Leonard Nimoy — who died Friday (Feb. 6) due to end-stage lung disease — by posting a photo of herself wearing a Starfleet insignia, holding up the Vulcan salute and looking toward Earth on Twitter Saturday (Feb. 28). The image is a tribute to Nimoy, famous for playing the logical and stoic Vulcan Spock on "Star Trek." "'Of all the souls I have encountered.. his was the most human,'" Cristoforetti wrote on Twitter, quoting a line referencing Spock from the original "Star Trek" series. "Thx @TheRealNimoy for bringing Spock to life for us." Cristoforetti's fellow space station crewmember, NASA astronaut Terry Virts, also posted a photo tribute to Nimoy. In the image posted to Twitter on Feb. 28, Virts holds up his Vulcan salute to a window as the space station flew above Boston, Massachusetts — Nimoy's hometown. Nimoy's private funeral was held Sunday (March 1) in Los Angeles, according to Yahoo. People around the world showed their love for Nimoy and Spock through an outpouring of support on social media Friday and through the weekend. "Thank you for all the love and kind words to Leonard," Nimoy's family wrote on his Facebook page the same day as his funeral. We lost a wonderful, talented, sweet man, a great father, husband, grandpa, and friend. Again thank you for all the love and good wishes. R.I.P and LLAP [live long and prosper]." NASA astronaut Terry Virts took this image from the International Space Station to honor Leonard Nimoy. NASA astronaut Mike Fincke and ESA astronaut Luca Parmitano also expressed their feelings about Spock and Nimoy in a video. Even President Barack Obama issued a statement about what Spock meant to him. "Long before being nerdy was cool, there was Leonard Nimoy," Obama said in a statement released Friday. "Leonard was a lifelong lover of the arts and humanities, a supporter of the sciences, generous with his talent and his time. And of course, Leonard was Spock. Cool, logical, big-eared and level-headed, the center of Star Trek's optimistic, inclusive vision of humanity's future. I loved Spock."